My dad, my brothers & I with our 400-horse power combine in 2006. Technology changed a lot during my father’s farming career, but the traditions he passed down to us continue. Traditions like taking care of the land so it can take care of you – a legacy I plan to pass on to the next generation. We wrapped up harvest this week and as I watched the equipment make its final rounds through our fields, I could still see my father sitting in the cab, even though it’s been 10 years since his last tour of duty running the combine. This September marked the sixth anniversary of my father’s passing as well as the sixth birthday of my oldest grandchild. My father never took much, if anything, for granted. He loved good food, a “good read”, the Chicago Bulls (Jordan Era) and he loved people. He also loved to farm and appreciated the technology that went with it. Pulled out of school at 13 (during The Great Depression), his farming life began holding the reins behind a few horses (the four-legged kind) and ended 75 years later in an air conditioned cab, on top of four hundred horses (diesel) that used satellites orbiting the earth to guide it through the field. I could elaborate at length on how much he appreciated the advances in technology in his farming career, but just suffice it to say, “a bunch”! He suffered through allergies (ragweed was the worst), long hours (never heard him complain much), and some daunting curve balls that “Mother Nature” threw his way. Embracing changes and advances in technology, helped alleviate his allergies, shorten his hours and helped him get a few hits off of some of the nasty pitches thrown his way. Thanks to the inventiveness of others (and some of his own), he provided for his family, made time to spend with his family, and left us a farm that was in better shape than when he acquired it. As I mentioned, my father didn’t take much for granted, including leaving the world a better place than when he entered it. I believe he truly was and is representative of the American farmer today. The conservation practices and farming traditions that farm families carry on today are because of the legacy of those who came before us and continue to touch us today! 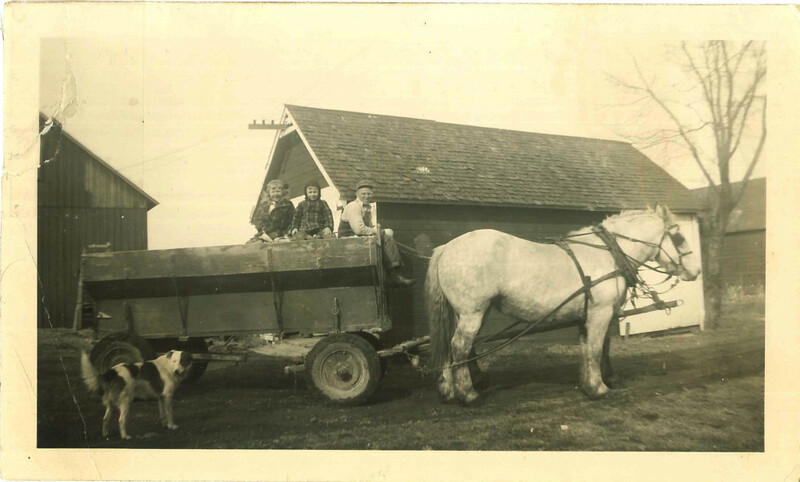 My dad started his farming career behind two horses (the four-legged kind). Here he is with the reins and my two older siblings circa 1950. As you may have noticed by the waves of amber grain disappearing from farm fields, corn and soybean harvest is rolling in full force. For farmers, harvest brings the culmination of a full year’s worth of work and then some in planning, selecting, planting & caring for their crops. Long hours & hard work! Harvest is a time-sensitive task and when it’s time to go, farmers are usually in the fields from sun-up to sundown or longer as long as a) the weather’s fit b) the crop conditions are right and c) the equipment cooperates. If you have friends or family who farm, you may notice they completely disappear from social events for a couple of months in the fall, as described by this chart from Illinois Corn Growers. Meals in the Fields: Farmers may not stop for lunch or dinner during harvest (see above), so meals are often delivered to the fields. Take a look at some creative and delicious ways farm families stay fed during harvest with ‘How to Feed a Farmer’ posted on the Watch Us Grow blog and ‘Field Meals to Go’ from Katie Pratt’s Rural Route 2 Blog. 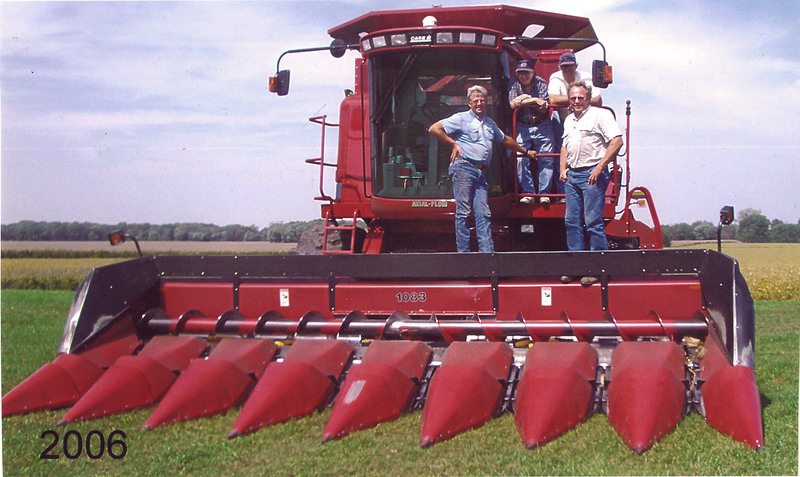 Technology & equipment: Today’s family farmers harvest data, not just crops. Sophisticated computer and GPS technology give farmers a wealth of information to make decisions and adjustments for next year. Take a closer look inside a combine with these photos from the blog Daddy’s tractor and get a glimpse of the bits and bytes of precision farm data in this article from Business Insider. Or if you want to watch harvest in real time, check out this opportunity to watch it on Periscope! Danger: Farming is a dangerous occupation and harvest carries many hazards. Big machinery with lots of moving parts, dry corn stalks that can catch fire from a spark and even fatigue from the long hours can lead to accidents. Do your part to help keep farmers (and yourself) safe! Slow down & pass with caution when you meet equipment on the road. Check out this advice from blogger Celeste Harned for more tips to stay safe. Helping Hands: Farmers are a close-knit community. Every year I see at least one story about farmers coming together to harvest crops for a neighbor in need. This week I saw three: One right here in McLean County, one near Champaign and another over by Galva, Illinois. 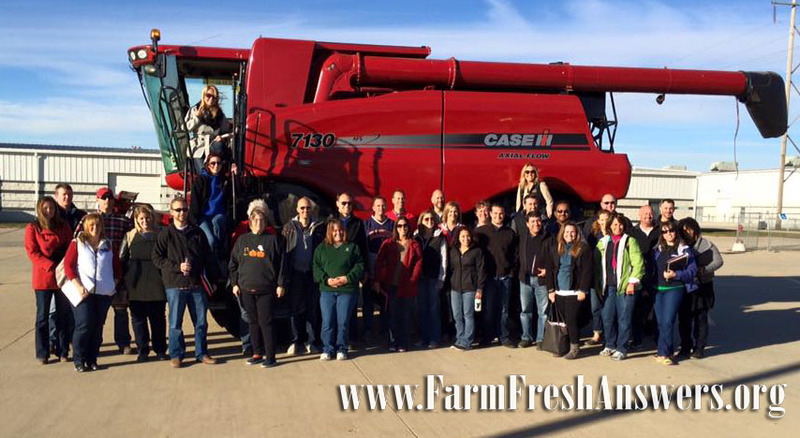 To see more, search & follow #harvest15 on Facebook or Twitter. What does harvest mean to you? When it comes to food, many of us (myself included) have a tendency to take for granted all the choices we have available and the convenience of easily accessible ingredients. What does it really take to make a sandwich from scratch? Try 6 months and $1,500! Check out this video series from How to Make Everything for a look at one man’s quest to grow and source the raw ingredients for a sandwich truly made from scratch. Transportation is an essential part of our food system, but not one most of us think about very often. Take a look at a few of the folks who haul food for a living in this article from NPR’s The Salt. Have you seen headlines about recently about a shortage of eggs? Or perhaps pumpkins? While things like avian flu and weather can cause supply issues (and maybe price increases), check out this perspective about how most of the ‘shortages’ we see in the United States tend to be overplayed, in an article from TIME. On the flip side, there are real differences in the cost of food in different areas of the country. A report on food costs called Map the Meal Gap 2015 from Feeding America shows differences in meal costs correlates with low-income and food-insecure families, as reported on MarketWatch. Even in today’s era of mechanized and computerized agriculture equipment, many fruit and vegetable crops are still harvested by hand. Here’s a look at a few of the more labor intensive crops in this article, also from NPR’s The Salt. 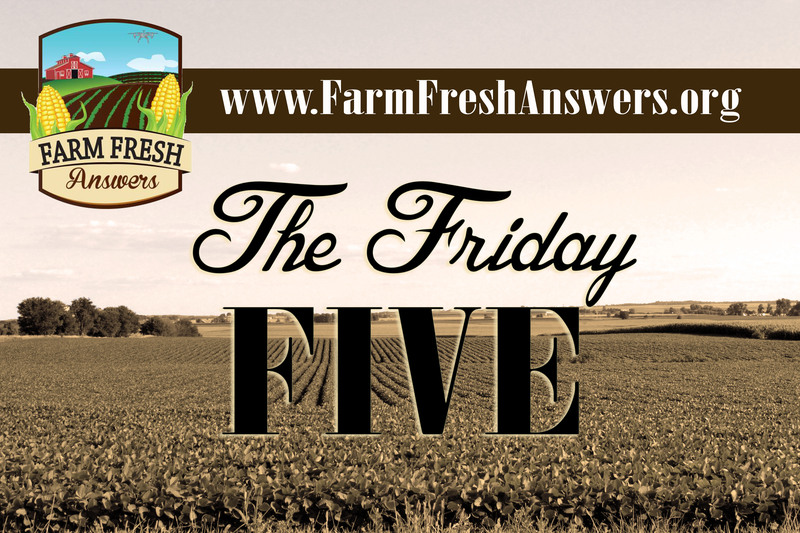 What do you appreciate most about your food supply? Looking for the perfect pumpkin for your front step? Or maybe some mums to fill out your fall flower bed? Central Illinois has plenty to offer! After all, when it comes to pumpkins – Illinois is the cream of the crop! Illinois farmers grow 80-85% of the world’s supply of processing pumpkins (used to make canned pumpkin puree & pie filling) and the majority of those are grown right here in the central part of the state. Explore local farm history with the 2015 McLean County Barn Tour Sat., Sept. 12 from 9 a.m. to 4 p.m. featuring interesting barns, antique farm equipment and more. The self-guided tour and begins at the Chenoa United Methodist Church and is sponsored by McLean County Barn Keepers. Rader Family Farms opens this weekend (Sept. 12). Located just west of Normal (look for the pumpkin topped silo), Rader’s offers plenty of pumpkins, a corn maze, kid-friendly activities, food & special events throughout the season. Also this weekend, you can head south for the Route 10 Farm Crawl Sun., Sept. 13 from 10 a.m. to 4 p.m. with activities at Mariah’s Mums & More, Timberview Alpaca Farm & Wagon Wheel Pumpkin Farm near Clinton, Illinois. For more pumpkin treats and festival fun, head to the Pumpkin Capital of the World for the Morton Pumpkin Festival Sept. 16-19, 2015. Sample the savory and the sweet with everything from pumpkin chili to pumpkin donuts & ice cream. And if apples are what you’re after, check out Country Mist Apple Farm near Heyworth, Curtis Orchard near Champaign or Tanner’s Orchard north of Peoria. Just remember when you venture out into the country, watch out for farm equipment! Harvest is just beginning for corn & soybeans, so be alert for slow moving vehicles on the roads. Slow down, pass with caution & be safe! What are your favorite ways to celebrate Fall?